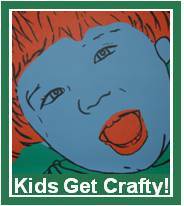 In this week’s Kids Get Crafty, we had a very special craft in mind. 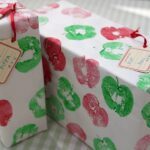 It was set as a special Christmas task by “Only Dads” – a support website for single parents, set up by a lovely single Dad from Devon. And so we did. 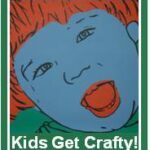 Don’t forget that this is also a link up party/ blog hop for all craftiness with and for children! Do take part. Do be inspired! Link up at bottom of post! Hooray! Old posts welcomed. 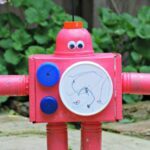 Grab a button and add it to your post or side bar. Please do NOT post things for sale or Giveaways! Who lived in a can by the dock. He came out with a smile. The rest of the time he would not. As you know Red Ted is not even three yet, so our decorating skills are limited to “sticking”. 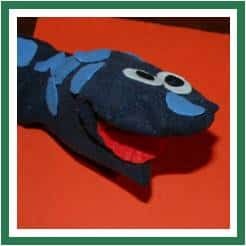 I decided that we could make a simple sock puppet. Sadly,my camera battery died JUST as we were about to start crafting. So you have to content yourself with the final result and some description! I cut out simple shapes: blue circles, 2 white circles, 2 black small circles and one big red oval out of felt. I held the sock over my hand and Red Ted stuck everything on (I added the glue for him first). HE decided that one of the blue dots should be a nose and giggled madly at doing so. I think it looks rather effective! After some vigorous playing and when Red Ted went to bed, I did top up the glue! We are now going to play with the lovely monster for a few days and then post him off to Only Dads. 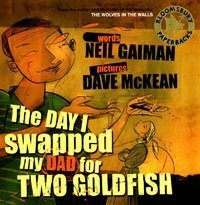 The Day I Swapped my Dad for Two Goldfish, Neil Gaiman. In some ways, this is a funny old book to choose in celebration of “Dads”. As this is a story about a boy who decides to swap his Dad for 2 goldfish. He doesn’t think too much of it until his mother sends him out to get his Dad back home. He then embarks on a journey – finding that his Dad has become the “latest” swapping trend (you know how kids like to swap). They seem to keep swapping him, as the children see things that their friends have and desire. So why choose this book about Dads? Well there is one phrase near the end the boy used, which simply is: “He is a very good Daddy”. And that is all you need to know. Of course it is a very cheeky books, but aren’t children supposd to be very cheeky? You may want to give your dad away at times, but ultimately you know, that you are lucky and have a “very good daddy”. The illustrations are amazing (they are much more big boy like: a dark cartoon style)and it is a fabulously different book, this is one for the eclectic book shelf! Ahem, after all that gushing, I have to admit, that Red Ted is interested in the book, but is still a tiny bit young for it and can’t quite concentrate until the end. Give him another year or two and I know he will adore. 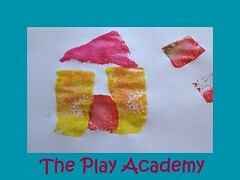 If you enjoy blog hops and link up parties.. do go and visit Cathy at the fabulous Play Academy every Friday! Just click on the badge below! My crafts are turkey related for Thanksgiving in the US this week – I do think the gratitude book and craft is appropriate for anyone, whether they’re celebrating this week or not! 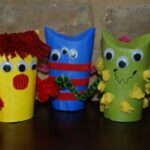 Love the sock puppet project and poem, sounds like a great cause! Anne – you make a very good point about giving thanks regardless on whether it is a tradition or not! I think next year, we will be taking part and doing some Thanks Giving crafts too!! 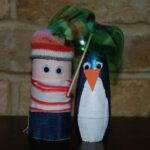 He’s a lovely monster – and you know I like a craft that turns into a toy for lots of extra play fun. What a cute puppet! Thanks for linking to Read.Explore.Learn. As a thanks for linking up, I tweeted about this post. Thanks for the invite, I would love to link up next week! thanks for the tip on the book, am now following @neilhimself on twitter, and will keep an eye out for more of his beautiful books….this one ‘goldfish’ was new to us, and we’re looking forward to playing the CD next time we go on a car journey, thanks lovely – my 6yo and 8yo loved it.